modern day designs | it's art by design!! Hi everyone and thanks for following. Just a reminder that you can check out all the daily General Chaos & Mayhem at my daily blog. I hope to have a new project on modern day designs soon. One of the boys found a string of Conch Shells. 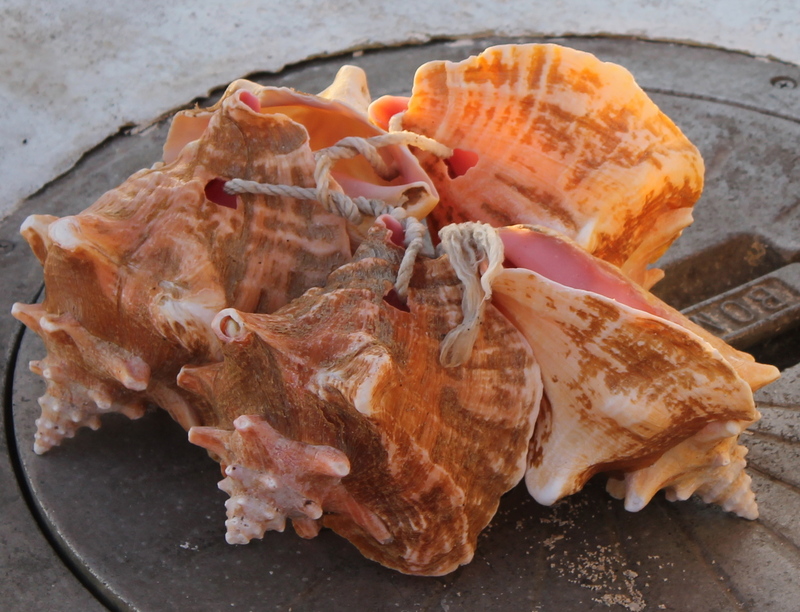 The pink of these shells is amazing. 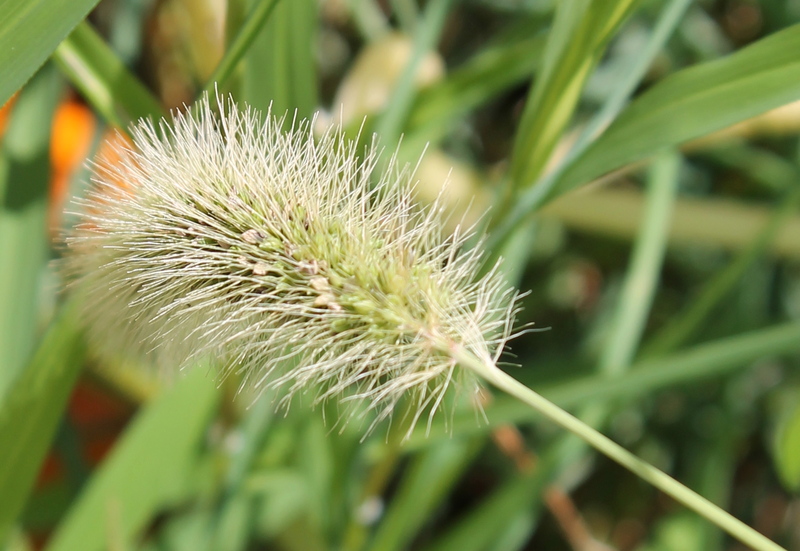 Manual focus lets me zero in on the detail I want want. The boys have returned to school. A Senior and A Freshman this year. 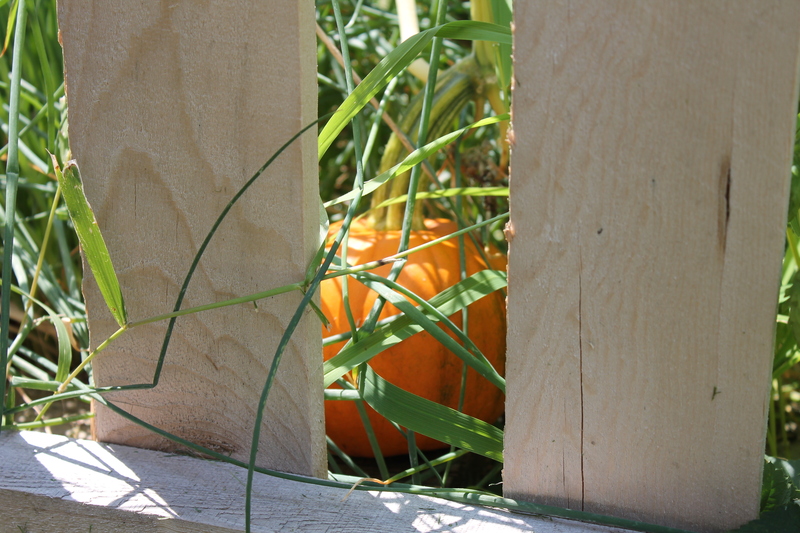 Fall changes everything. The Routine, the grocery shopping, when dinner needs to be ready, times to get up and out of the house. 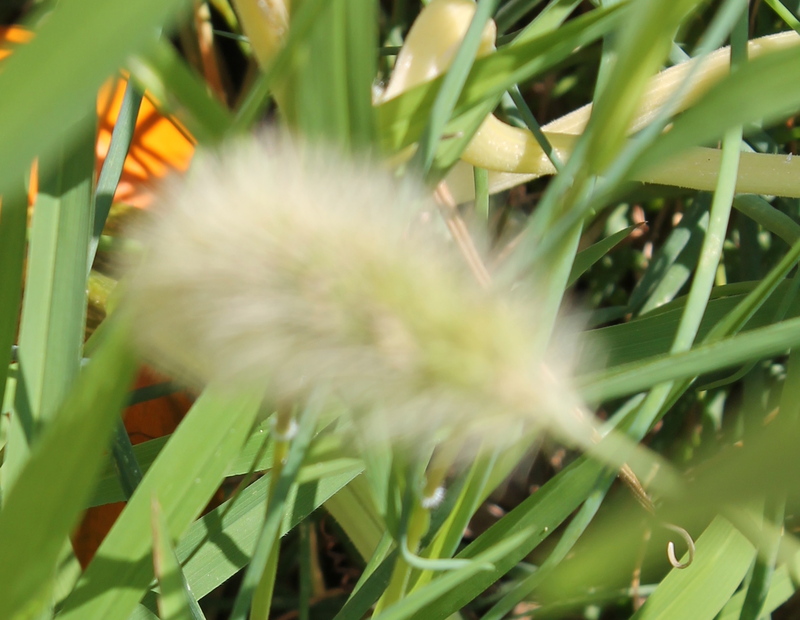 Nothing better than seeing the orange appear that cool days are on their way. In going through old photo disks for my origins post on moderndayfitandfood.com, I found these twin quilts that I had made for Wayne (Papa) and Liz (Gram). They were completed in 2005 and were inspired by Gram & Papa’s recent trip to Hawaii. 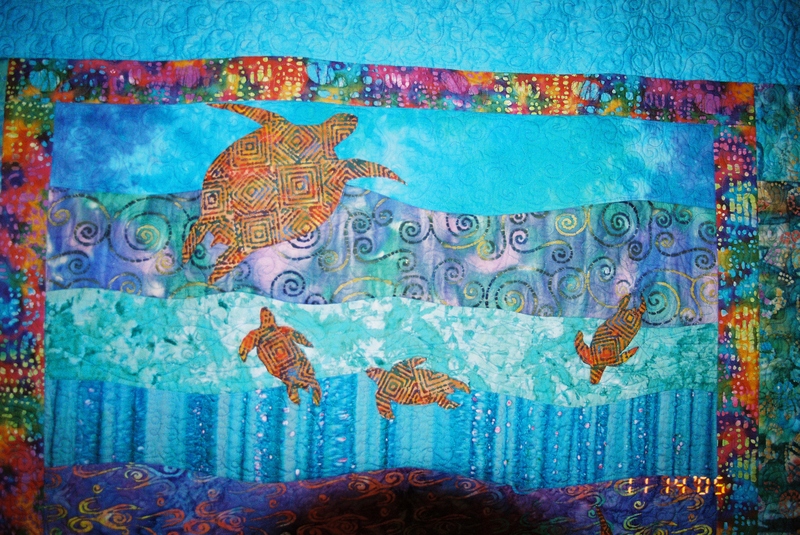 That night I dreamed of a grand adventure, as Gram and Papa set out to spy an Honu Ohana. I imagined them floating silently above the swimming turtles. 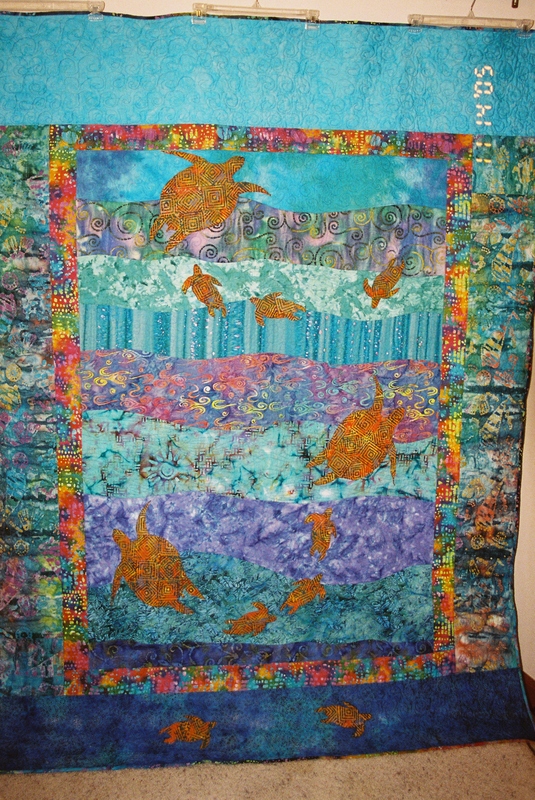 The colors of the sea were changing as Honu glided through the current. The mo-opuna held their breath and dove as deep as they could. And suddenly, they were hatchlings, vying for position to catch the next wave just like their Kupuna. Then. Just as quickly, their breath was gone and they swam quickly back up to the bright blue of the breaking waves. 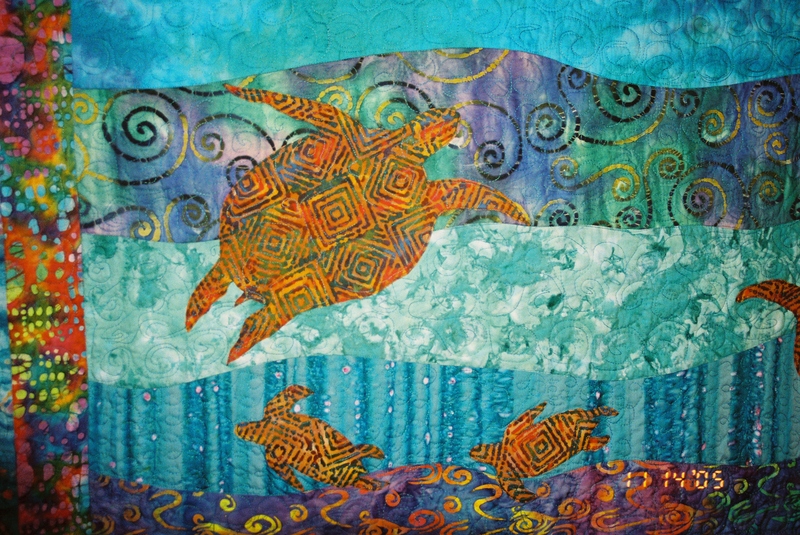 When I awoke, I immediately sketched the design of these quilts. I hoped they would bring many blessings and a good night’s sleep to all who Gram and Papa welcomed into their home. ‘A ‘ohe loa I ka hana a ke aloha Distance is ignored by love. Between snowmageddon, being sick, general craziness with a new puppy in the hours . . . I finally finished this batik beauty. As usual, Michele’s is wonderful. She finally let me use king tut variegated thread on a piece and I think it came out lovely. Lots of ruler work, templates and stitch in the ditch. But mark this one in the done column,. I am sooooo excited to finally be able to post the cub scout quilt I quilted for Susan Van Kirk Beyer and her Cub Scout pack. Their Blue & Gold event was last night and the quilt was finally presented to Matt. 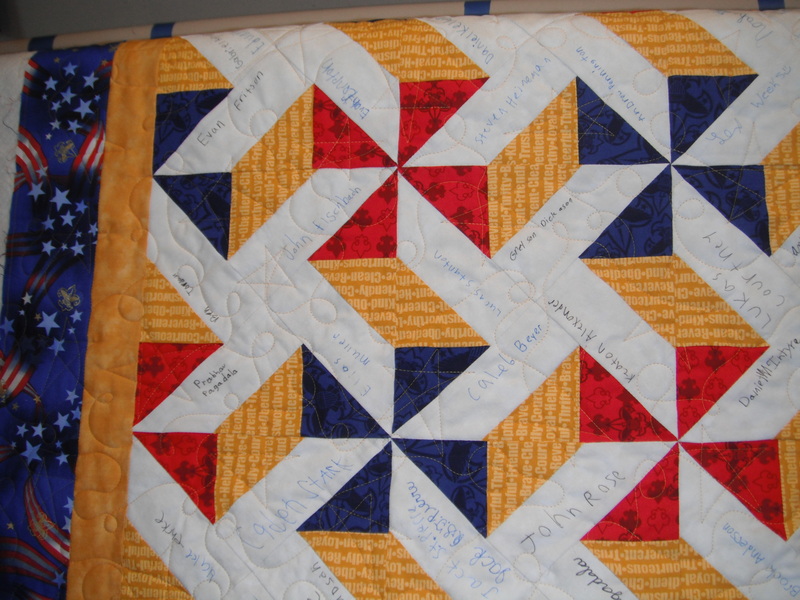 This is a signature quilt where all the cubs signed the quilt as a gift for their out going CubMaster. Susan points are beautiful. The colors chosen fit the scouting theme to a dream. 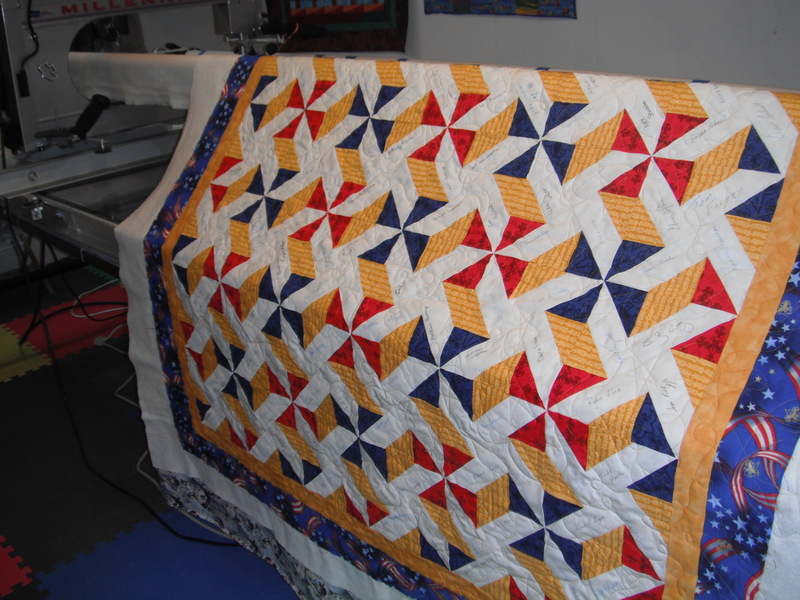 The quilting pattern is my swirls and stars. The gold thread brings out the golds in the fabric. I made a special point to not quilt over any of the cub scout names. My new camera is helping to take some fantastic pictures this vacation break. But my favorite is getting the boys with the dogs. So. 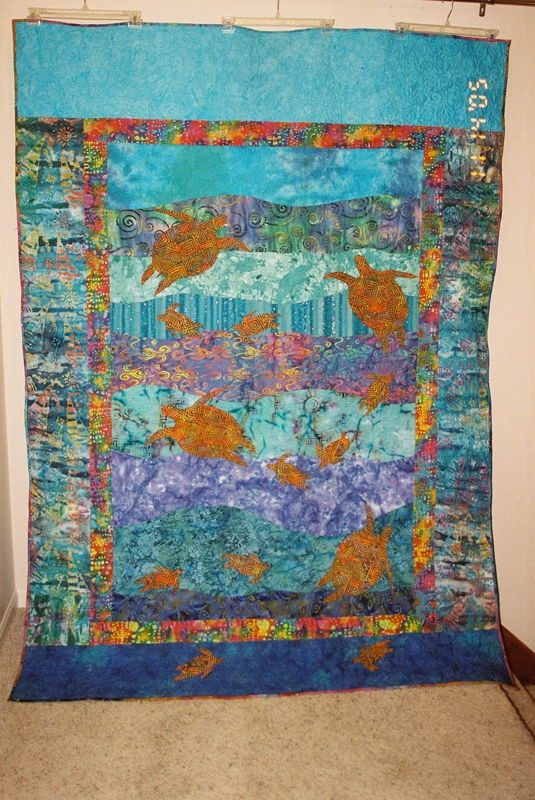 . . just how do you add borders or make a quilt bigger without creating that friendly wave. 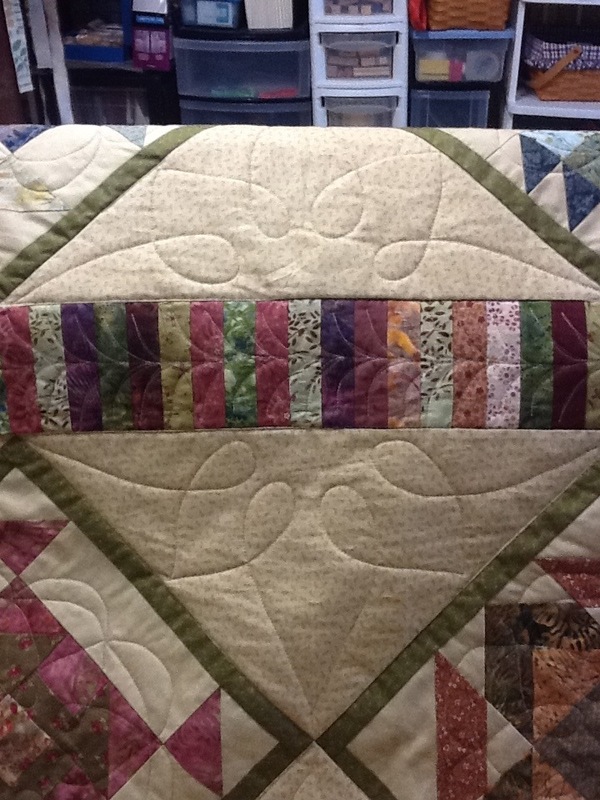 Once you get the technique, you’ll be so much happier with your final quilt. stretching seams when you add on the next border. 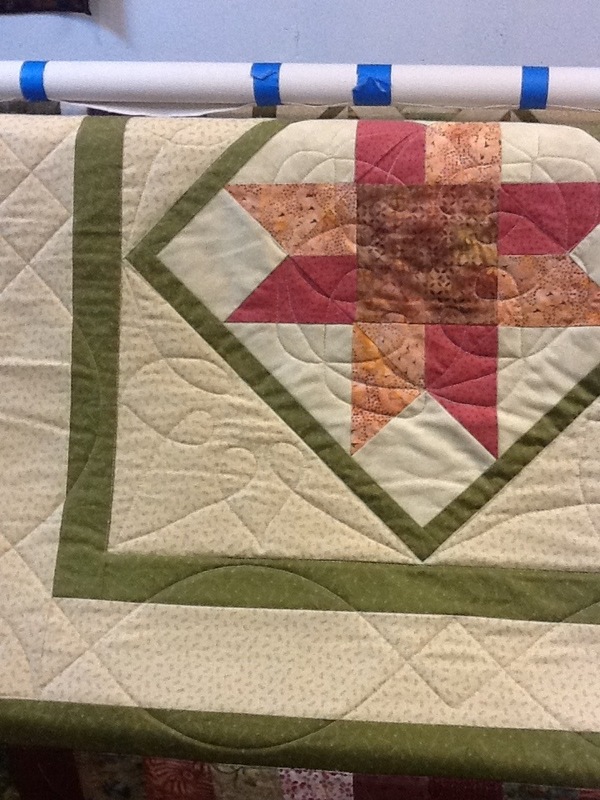 For me, I am not a very precise piecer. So my early quilts were extremely friendly. As you can see in this picture, the edges of my blocks are very jagged. 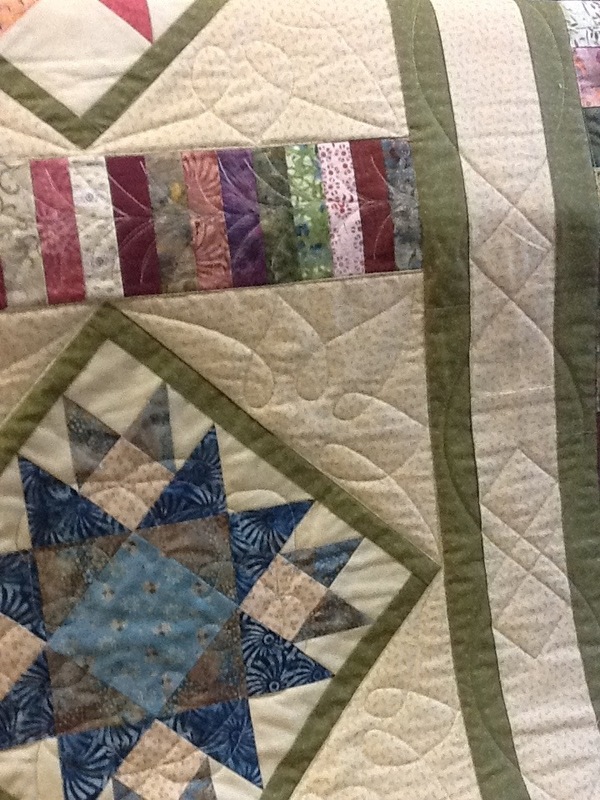 As I add the white border on my strips I am conscious to 1) make sure the border is placed at the smallest point of the neighboring block and 2) don’t pull the border to “make it fit”. When you push to make the fabric go in different directions, you end up stretching the fabric. This stretching is what causes the wave. The longer the seam you will be sewing the more I would urge you to pin your pieces before you sew. This lets you keep control of the parts as you push the fabric through the sewing machine. 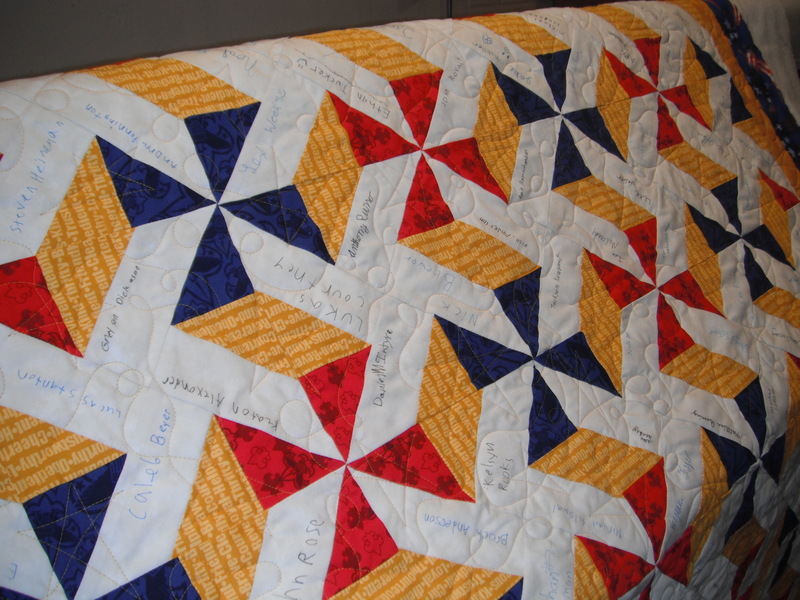 Once the seam is complete, use your ruler and trim the excess so you don’t have color fade through to the front of your quilt top. In the end, this process takes a bit more time, but if you are challenged creating a “perfect” 1/4 inch seam ( LIKE ME!!! ) 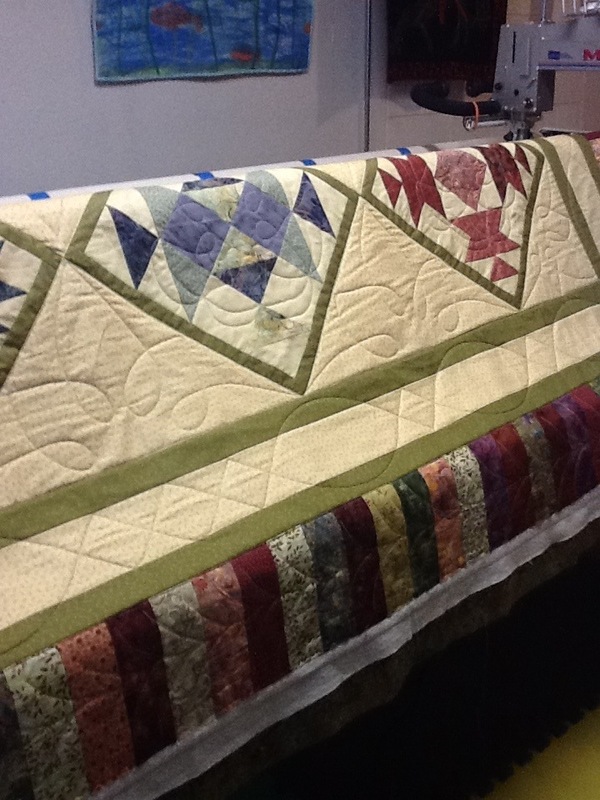 both you and your machine quilter will be happy with how your quilt turns out.